The 2014 season of the Mountain Bike World Cup concludes this weekend in the new venue of Méribel, with the overall titles being awarded in the Eliminator, Downhill and Cross-country disciplines. Located in the Tarentaise Valley of the French Alps, Méribel is famous for hosting the 1992 Winter Olympic hockey and women's alpine skiing, and is within the Vanoise National Park. The World Cup action begins on Friday with the sixth and final round of the Eliminator. The 725 metre course sends the riders off a gondola platform at the chairlift station, down four start ramps and straight into the 'Meribel Wall', a big wall ride, before a series of jumps, log and rock sections, a short climb, and a final banked turn into the finishing straight. In the women's competition, Kathrin Stirnemann (Sabine Spitz Haibike) has mathematically won the World Cup with 225 points after Round 5, since Jenny Rissveds (Scott Odlo), at 160 points, cannot surpass her total in the final round. Rissveds is tied on points for second with world champion Alexandra Engen (Ghost Factory). 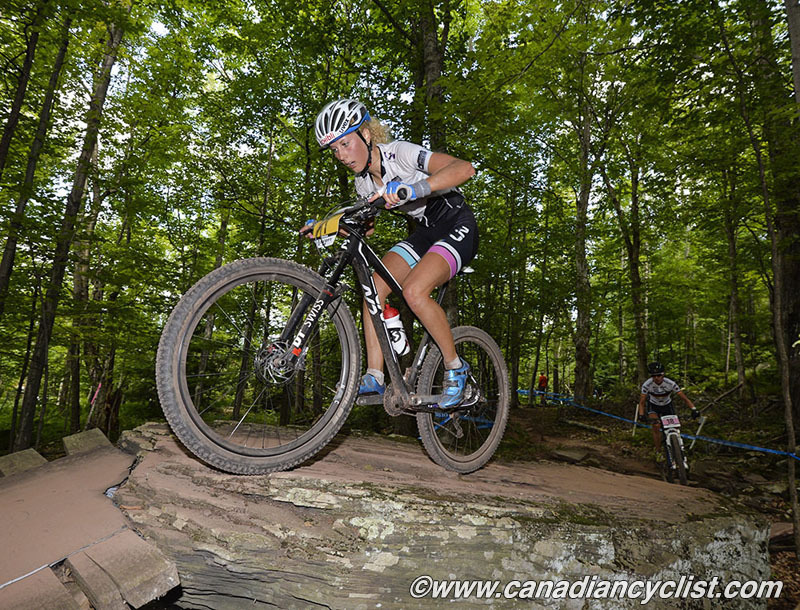 Canada has one entry in the Eliminator, Rachel Pageau. The men's title is still up for grabs, with three riders still in close contention. World Cup leader Fabrice Mels extended his lead in the overall standings over world champion Paul van der Ploeg of Australia after the last round, and now has 157 points to van der Ploeg's 138, with defending champion Daniel Federspiel (Otztal Scott) in third at 130 points. Saturday is Gravity Day, with the attention shifting to the Downhill for the seventh and final round. The track provides stunning vistas of the mountains surrounding the valley, but riders won't have a lot of time to enjoy the view on this steep, fast track that drops 550 metres in 2100 metres length. From a very open and fast top section, riders drop into a series of rooty, rocky wooded segments that are likely to be muddy and slippery, before a final open and fast section with sweeping turns that will allow spectators to watch riders coming into the finish arena from a long distance out. The competition for the women's title tightened up after the previous round. Manon Carpenter (Madison Saracen) continues to lead the standings with 1180 points, but Emmeline Ragot (Lapierre Gravity Republic) is now only 70 points back after her win in the previous round, and world champion Rachel Atherton (GT Factory) is 120 points in arrears. 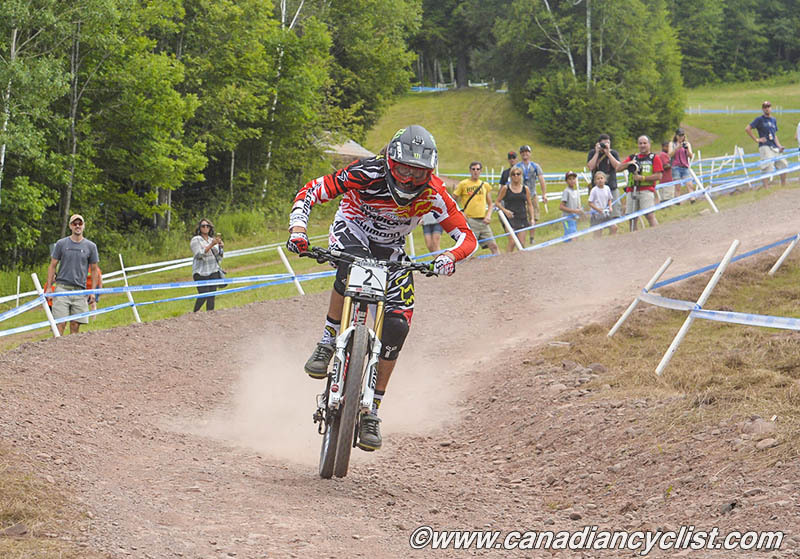 Micayla Gatto (Pivot Factory DH) is the top Canadian butwill not race in Meribel, recovering after a crash at the Windham where she hurt her hip. 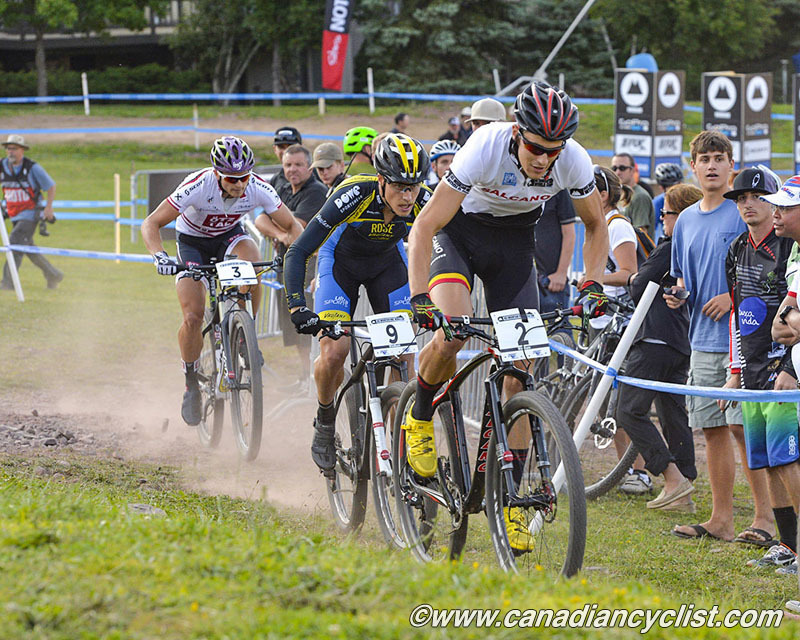 Gatto is immediately followed in the standings by Casey Brown (Bergamont Hayes) and Canadian champion Vaea Verbeeck. The men's lead changed after the last round, with Josh Bryceland (Sanata Cruz Syndicate) overtaking Australia's Troy Brosnan (Specialized Racing DH). Bryceland now leads with 1007 points, with Brosnan second at 964 and Aaron Gwin (Specialized Racing DH) in third with 925 points. Australia's Sam Hill (Chainreactioncycles.com/Nukeproof), after his win in Round 5 has a solid lock on fourth. 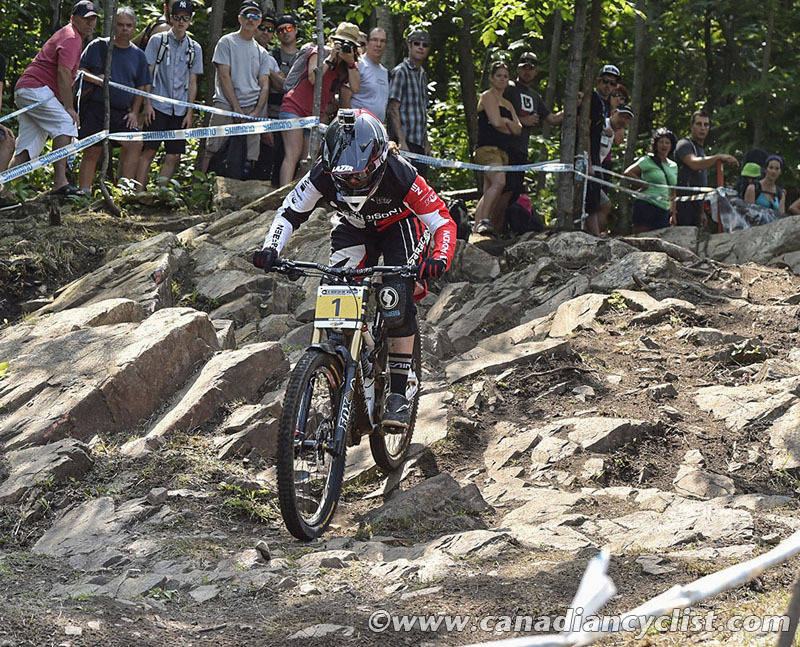 Canada's top contender, Steve Smith (Devinci Global Racing), is still out with a foot injury, so the top ranked Canadians on the start list are Forrest Riesco and Mark Wallace (Devinci Global Racing). In the Junior men, Jack Iles (Evil Vengeance Tour) will be looking to move up from sixth to fifth. The 2014 World Cup concludes on Sunday with the Cross-country. The 4.7 kilometre course is old school - lots of natural rough, rooty and rocky sections, with considerable steep climbing. In the dry it is technically demanding, in the wet only the most skilled riders will be able to ride every section. The women's overall title was mathematically won by Jolanda Neff (Liv Pro XC) after Round 6, but the there is a tremendous battle for the rest of the podium spots, with eight riders vying for four spots. 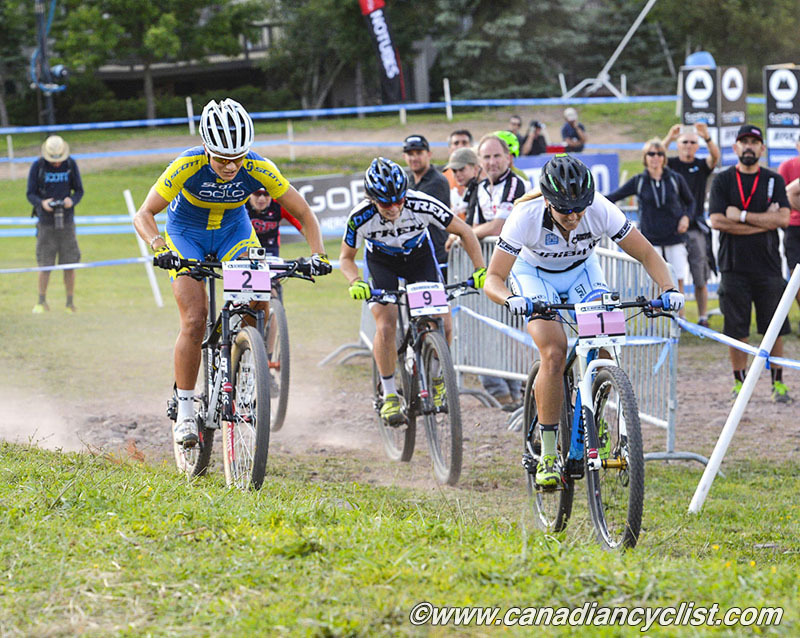 Canadian champion Catharine Pendrel (Luna) is showing very good form at the moment, coming off a solo win in the last round, but defending World Cup champion Tanja Zakelj (Unior Tools) has been steadily improving all season and sits only two points behind Pendrel in the battle for second overall. Emily Batty (Trek Factory Racing) is one of those riders battling for the top-5 overall, and is currently fourth in the rankings, 88 points behind Zakelj. The men's series is down to two riders - World Cup leader Julien Absalon (BMC) and his constant rival, world champion Nino Schurter (Scott Odlo). Between them, they have won all six events this year, and are currently tied at three apiece. While it would take a miracle for Schurter to overtake Absalon for the overall title after missing one round, the duo will certainly battle to break their tie in wins. 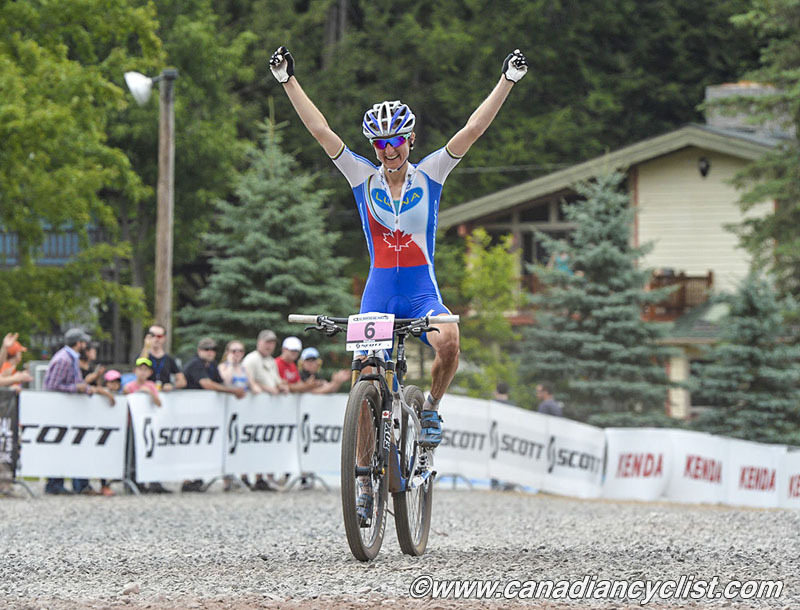 Most of Canada's top men are not attending Méribel, with Max Plaxton (Cannondale Factory), Geoff Kabush (Scott-3Rox), Derek Zandstra (Scott-3Rox) and Raphael Gagne (Rocky Mountain Factory) all opting to give it a miss as they prepare for the world championships.